The color of the periderm (skin) can be yellow, orange, copper, red, and purple; the flesh can be white, yellow, dark orange, red, and purple. Copper-colored skin with orange-colored flesh are the most common varieties sold in non-imigrant markets in New England; however, most Latinos and Brazilians prefer white-fleshed varieties (Figure 1, Figure 2, Figure 3). Sweet potato is a staple in parts of Brazil, where it is served mashed, fried, and baked. 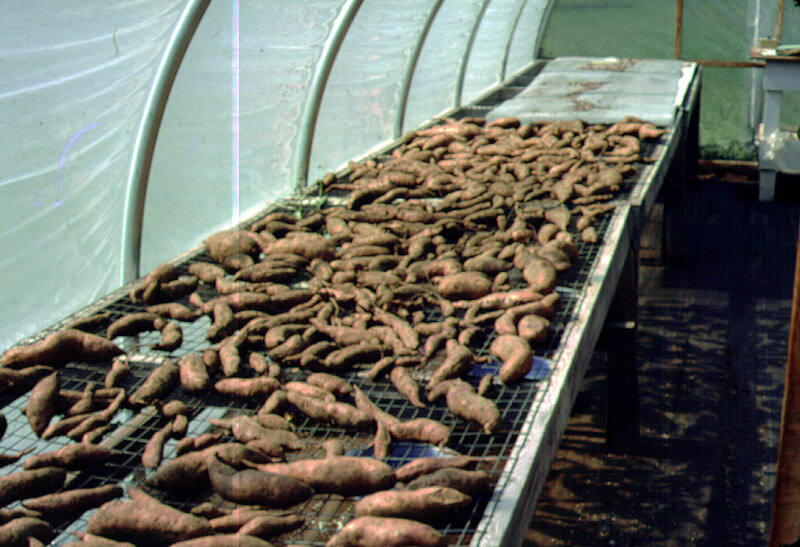 Sweet potato needs between 90 and 150 days of a frost free period to produce harvestable roots. In southern areas of the US, larger growers produce their own slips. It is recommended for New England that slips be purchased from certified companies that provide disease-free slips. 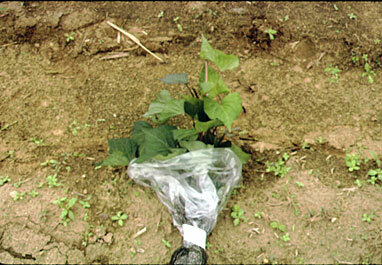 Sweet potatoes grow best in well-drained, loam soils which result in larger and well-shaped roots. Sweet potatoes grown in heavy clay soils, or in soils with high soil organic matter can result in rough, irregular roots. Field planting begins when all chance of frost has passed. Soil temperature in the production field should reach at least 65 degrees at a 4-inch depth for 4 consecutive days before transplanting. Trials at the University of Massachusetts showed that yields were increased with black plastic. Rows are 32 to 42 inches apart with in-row spacing 8 to 12 inches, depending on cultivars. The sweet potato plants (slips) are transplanted into the rows at a depth of 3 inches with no less than 2 plant nodes in the ground and leaving at least 2 leaves or more above the ground. Sweet potatoes do not need high levels of nitrogen, and in fact yields may be reduced if excess nitrogen is added. Available nitrogen should not exceed 75 pounds/A. If manure or compost is added, then be careful not to add excessive nitrogen fertilizer. Sweet potatoes do need high levels of phosphorous (up to 200 lbs/A) and potassium (up to 300 lbs/A). Phosphorous and potassium can be applied at planting and nitrogen can be split between application at planting and before plants begin to run. Nutrients should be applied according to soil tests. 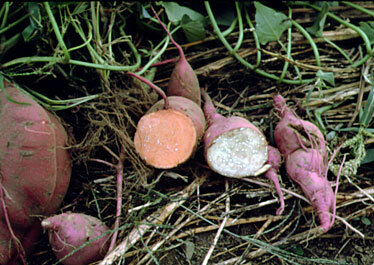 Sweet potatoes also require more boron than many vegetables. On boron deficient soils, 0.5 pounds B per acre (5 pounds Borax or 2.6 pounds solubor) should be added to prevent a disorder called blister. This disorder is characterized by small, raised bumps on the root surfaces and plant stunting. Storage roots continue to grow until the leaves are killed by frost. Time of harvest is often determined by digging up a few representative plants and determining the percentage of roots in the size classes. When tops of the plants turn black after the first frost, it is imperative to harvest as quickly as possible. Sweet potatoes are very susceptible to damage at harvest, so care must be taken. Sweet potato roots do not have a thick protective outer layer of cells such as that on white potato tubers. Any abrasion can lead to rots in storage. Recommended varieties for the Northeast include “Beauregard”, “Carolina Ruby”, “Hernandez”, and “Jewel”. Many varieties preferred by immigrant groups from tropical areas are “dry flesh” varieties, as opposed to the “moist flesh” varieties preferred in the US (all the ones recommended above are “moist-flesh varieties”). 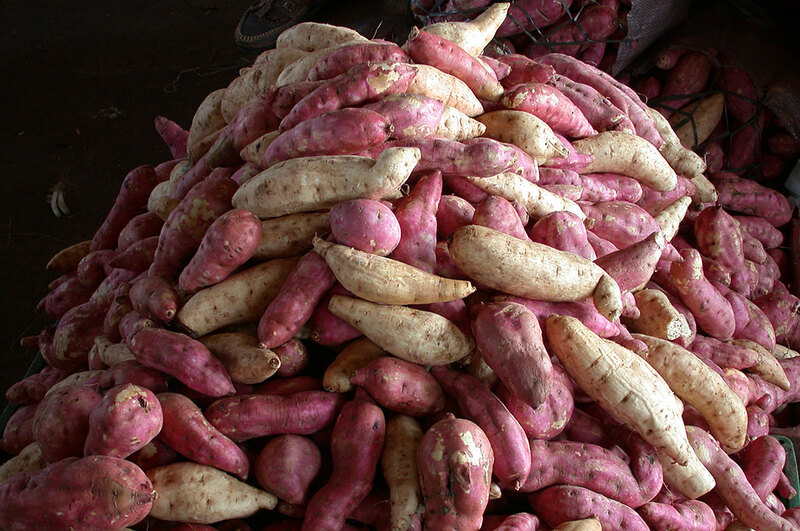 Curing is recommended when selling sweet potato wholesale. This minimizes further damage by healing harvest wounds. Maintain roots in temperatures between 80 – 86 degrees and a high relative humidity (85-95%) for 4 – 7 days. This forms a corky periderm layer below the damaged areas which limits microbial invasion and water loss. Also during curing there is a loss of dry matter (respiration) and an increase in sugars, which increases flavor.